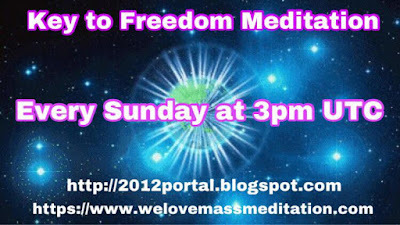 CORRECTION: The timing of the weekly key to freedom meditation has changed to Sunday at 3 PM UTC. It will replace both Breakthrough Meditation and Weekly Ascension Meditation on Sunday. 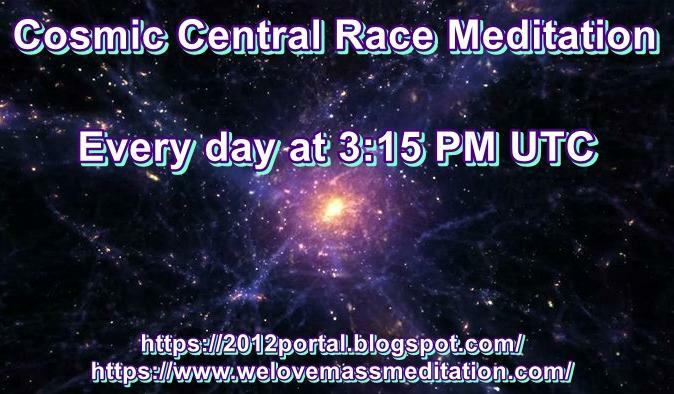 As a result, Emergency Meditation will be moved to 2:00 PM UTC. Apologies for any confusion. 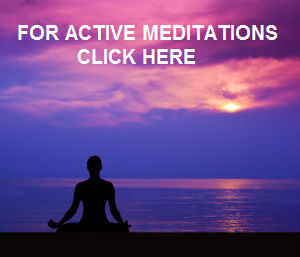 Further changes to meditation schedule will be announced in the coming week. 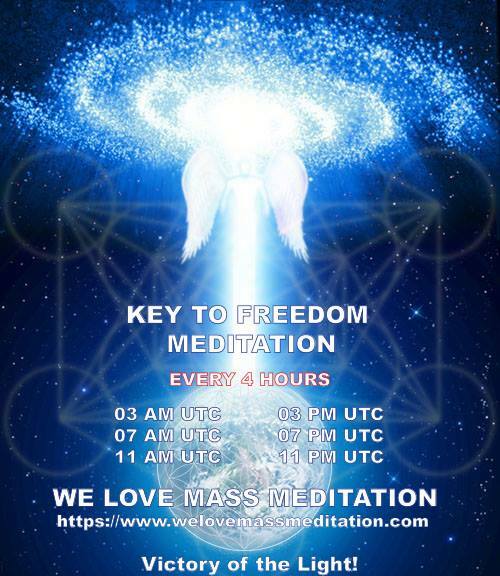 After the Key to Freedom meditation on August 11th, the Light Forces have requested for us to continue with this meditation weekly, thus we will be doing this meditation every Sunday at 3 PM UTC. 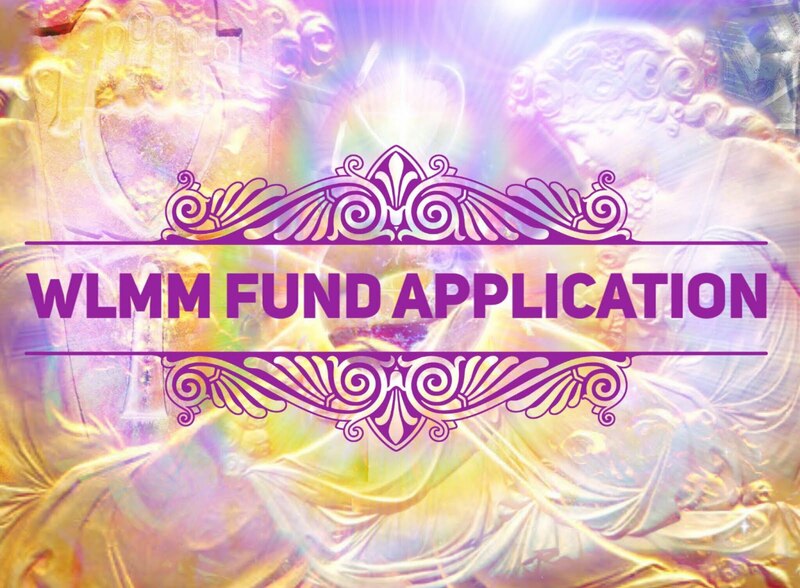 As a result, there will be NO Breakthrough Meditation and Weekly Ascension Meditation on Sunday, and Emergency Meditation will be moved to 2 PM UTC. 2. State your intent to use this meditation as a tool to speed up the process of healing for Earth and its inhabitants, removal of toplet bombs and triggering the Event. 3. 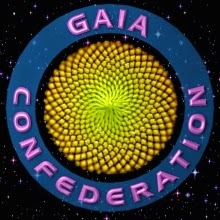 Visualize a pillar of electric blue Light emanating from the Galactic Central Sun, then going through Orion stargate (Al Nilam / Epsilon Orionis star in the Orion constellation), then entering our Solar System and going through all beings of Light inside our Solar System and then through your body to the center of the Earth. 4. Visualize another pillar of Light rising from the center of the Earth, then up through your body and upwards into the sky towards all beings of Light in our Solar System and our galaxy, going through the Orion stargate and finally connecting with the Galactic Center and the Source. 5. You are now sitting in two pillars of Light, the Light flowing both upwards and downwards simultaneously. Keep these pillars of Light active for a few minutes. 6. 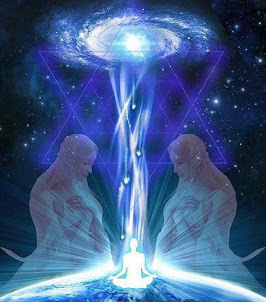 Now visualize the White Fire of AN, emanating from the Source, flowing through the Galactic Center and through the Orion stargate towards the Earth, purifying all remaining toplet bombs on plasma plane around the Earth. Visualize the Light Forces of Galactic Command Fleet removing and dissolving all remaining toplet bombs with their advanced technologies. 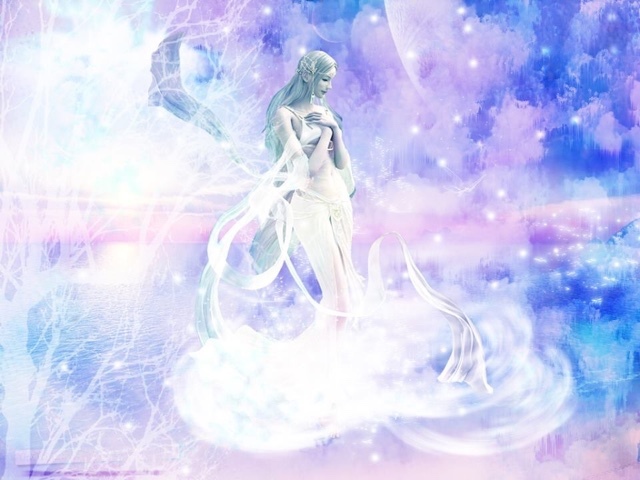 If you feel guided you can call Archangel Metatron to assist in purification process. 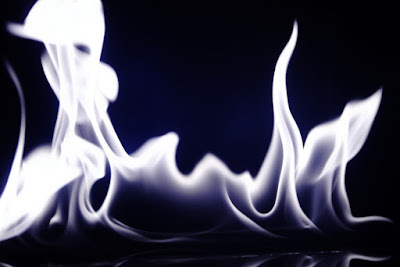 Visualize the White Fire of AN purifying all anomaly and reversing all entropy within the plasma shield around the Earth. 7. 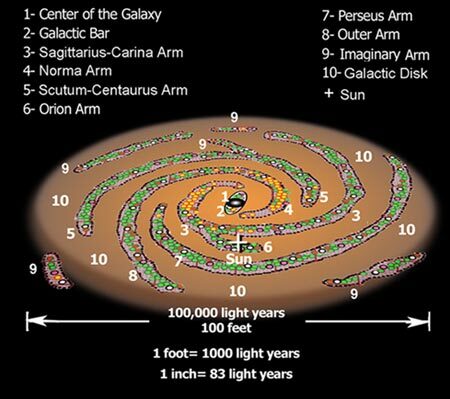 Visualize the Event happening, restoring Oneness, Harmony, Peace and Prosperity to Earth and her inhabitants. 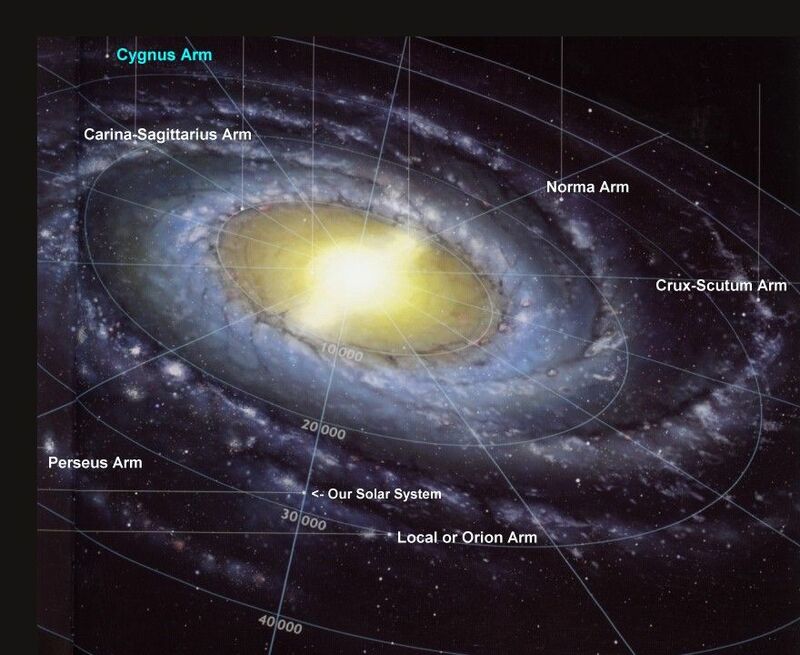 Visualize Source Light manifesting itself easily on planet Earth and bringing quarantine to an end. if we feel it needed! Thank you !!! I love so much this beautiful meditation ! 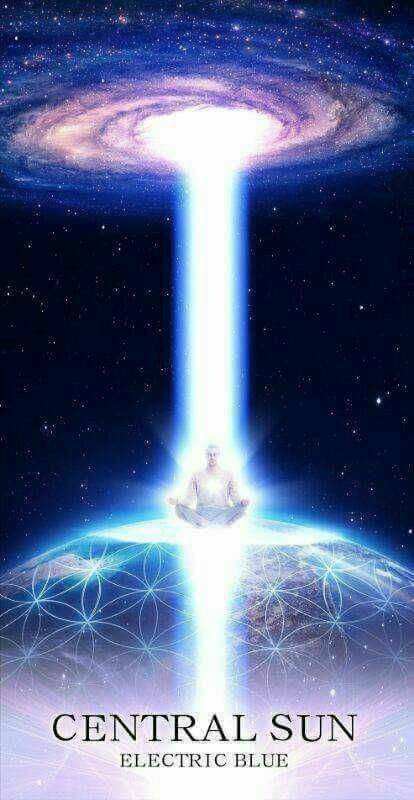 I can usually make it in the evening, but it's not a difference, even is joined at another time, I feel it's so powerful, energies are covering my body outside, I feel rising them inside ... when is over, I could stay more in these positive, high level energy fields created within our meditation ! Mass meditations has an incredible power to shift our consciousness ans rise our energy to be able to fulfill our ascension ! Victory of the Light !!! Hi I think we are an hour later 4pm.I usually do one at 12 00am as I'm a carer for my my mum. Preciso transmitir um conhecimento que me foi dado, há tres anos, da Chave que existe no fundo do Oceano, que precisa ser arrancada de lá e tudo o mais que lá foi fixado, firmando o reino da dualidade na Terra. Está numa caverna submarina. 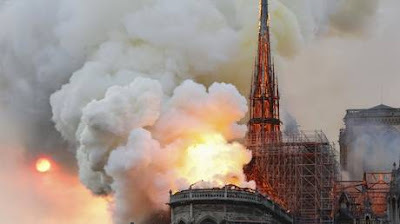 Na entrada estão as guardiãs Àguas Marinhas, é preciso passar por elas, e pisar nas pedras que estão firmes, algumas estão em falso, afundam . Se conseguir pisar nas pedras firmes, chega-se ao local onde está o referido Artefato, e arrancar tudo de lá, e trazer para a superfície. 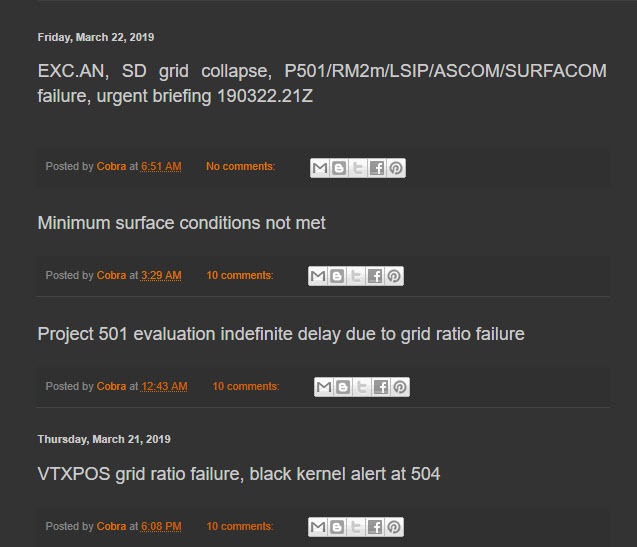 Assim que isto for feito, acontecerá a transformação para a Era da Luz. 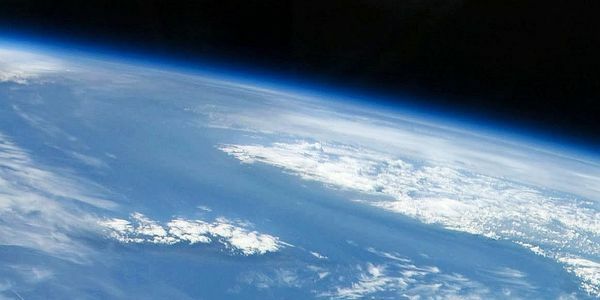 È o fim das trevas, o Planeta Terra se instalará na 5ª Dimensão. Os Olímpicos, Apollo, Mercúrio sabem disso. Também Saint Germain. Todo o grupo que trabalhou nos ajudando, tem conhecimento desse fato. Tenho a impressão que eu fui até aquele local, na bilocação. Porque no dia 11 de julho próximo passado, eu voltei da bilocação, muito mal. Passei por uma semimorte. Fui atingida por uma arma de projeção ou coisa parecida no lado esquerdo do meu cérebro, com tontura demasiada, e muito mal. Fui medicada e fiquei em tratamento por duas semanas. Nunca antes estivera tão mal. Porém me recuperei , mas não tenho mais ninguém aqui a quem possa me certificar, o que aconteceu. Se realmente aquela magia ainda continua no fundo do Oceano. E pode ser que os obscuros estão fortalecendo aquela magia para que o fim do poder deles não aconteça. Confio em você Cobra, e na tua equipe. It is a new week from tomorrow. Do not catch a cold.